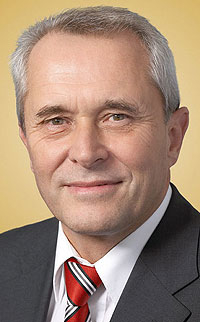 Skoda CEO Jung does not want to upset suppliers. PRAGUE -- Skoda will continue to produce its lower-medium Octavia at the Volkswagen Slovakia plant in Bratislava but will slash volumes by two-thirds. Skoda started making the Octavia in Bratislava in early 2008 due to higher-than-expected demand for the car and limited capacity at the paint room in the cars main factory in Mlada Boleslav, Czech Republic. But capacity was no longer an issue in late 2008. New-car sales declined so much that Skoda slashed production by 18,000 units in November and December. This caused some to question whether the Octavia work in Slovakia should be moved back to the Czech Republic. You cant decide where to make cars ad hoc, Skoda CEO Reinhard Jung told reporters questioning why the automaker was continuing Slovak production. He was speaking at the December opening of Skodas new technical center in Mlada Boleslav. In 2007, we decided to balance capacity usage and decided Bratislava was the right spot. We will stick to the 2007 decision, he said. Assembling cars in Slovakia also makes it easier to compete in government tenders. Slovak-made Octavias, however, have a higher logistics cost than those made in the Czech Republic. Skoda stamps and welds the car bodies at its main plant in Mlada Boleslav, then ships the bodies-in-white by train or truck to Bratislava for painting and final assembly. Skodas market share in Slovakia has fallen from 45 percent to 19.2 percent in the past decade.